Whether it is at a live performance or in the studio, having to jump back and forth between the computer and your other music making hardware can really impede your workflow. It is no wonder that the best practitioners of controllerism often use their DAW only as a base and work directly from their MIDI devices. However, there are so many different types of MIDI devices available today, trying to collect a full suite is not just expensive, it is also redundant. Moreover, many of the more modern types of MIDI controller also incorporate some type of instrument design-like a keyboard or turntables. This makes the humble MIDI pad is still one of the best and easiest controller designs on the market. That is why we have put together a helpful buyer’s guide and a list of the 5 Best Midi Pad Controller on the market today. With the ability to control numerous features from your daw with the press of a button, the pads of a MIDI pad controller are arguably the most important feature. Form a general perspective, the pads should be large enough to easily differentiate and firm enough to feel solid when pressing. Ideally, the pads will be made out of some form of non-stick material. This is especially relevant if you are performing live where the lights, heat from the hardware, and body heat from the audience can cause the temperature to spike. Rubber is the most common, but even a harder, textured plastic will often suffice. Number – This quality will depend heavily on the type of music you produce. If you play a more minimal style of music, like a fair variety of hip hop and some electronic genres, the total number of pads for your MIDI pad controller will not weigh as heavily. In this case, eight to sixteen pads will often be plenty. However, some of the more maximal styles of hip hop and a wide variety of electronic will require a minimum of sixteen pads and can demand for more than that depending on the arrangement. In this case, data banks can offer some leverage, but you may find the sixty four pad MIDI pad controllers more your style. Action – The action refers to how it feels when pressing the pads. This can range from anywhere to exceedingly stiff to fairly loose. However, the industry standard for quality generally tends to err on the side of stiff over loose–if for no other reason than durability concerns. Ultimately, the preference will likely boil down to your playing style. Music producers that have an animated or impassioned playing style will likely prefer a firmer pad action to account for their rougher pushes. However, a more measured and precise player will often be fine with looser pad actions, potentially finding a stiffer action to feel a bit restrictive or unresponsive. Velocity – Similar to digital keybeds, the velocity of the pads refer to how the force of the push alters the voice assigned to the pad. Essentially, the harder you push the pad, the louder the voice plays–and vice versa. Unlike with the action, the velocity of the pads generally have a definitive scale of quality that transcends playing style. Ultimately, the more points along the velocity curve that a pad can activate, the greater variety and nuance a music producer can introduce into their tracks. In this case, the rougher players will likely not notice too much of a difference, but the more measured players will most certainly appreciate the breadth of expression. This quality bridges the gap between the hardware and the software. While it is technically a component of the software in digital MIDI controllers, the encoders are still circuitry which reads the analog input and determine how that signal is expressed. Once again, there is a clear spectrum of quality irrespective of playing style here. A quality encoder is unlikely to be noticed by someone unfamiliar with MIDI controllers. In fact, a quality encoder will present as “business as usual.” It is when a MIDI controller has bad encoders that you will notice them–specifically, the encoders will register the action incorrectly, which can manifest in a number of ways. Keep in mind, encoders often refer to the knob controls which can be confusing since they are different functions with the same term. This feature may seem like a bit of fluff, but novices and veterans alike are liable to find it so convenient that its absence is striking. Basically, this quality determines how the MIDI pad controller responds with a visual light cue, if any, when the pads are pressed. Depending on the complexity of your MIDI pad controller, this feature can manifest as a simple LED to acknowledge the pad has been pressed to a complex array of light bars making use of numerous pads to control DAW effects to numerous colors representing different sequences, samples, or voices. Generally, the more lighting options the better as this provides more information and control, but this can also create a steeper learning curve when first figuring out how to use the MIDI pad controller. While far more common among MIDI keybeds, aftertouch effects are beginning to make their way onto MIDI pads as well. This feature activates a secondary effect on the pad after you has already pressed it. Once the initial effect activates, an additional press before releasing the pad will activate a secondary effect. This is most commonly used to trigger an effect, like reverb or pitch bend, on a voice assigned to the pad. While aftertouch can provide an additional degree of expressiveness to the voice in your track, MIDI pads are not always as reliable with the feature as say digital keybeds. This refers to any set of features that allow the music producer to control the DAW or MIDI hardware that are not pads. Some controls can be assigned to features or effects within the DAW, while others may simply be used to navigate the DAW itself without activating a feature or effect or provide a wholistic control. For instance, transport controls are used to determine the entire track itself and commonly include skip, find, start, stop, and record functions. These work similarly to the same controls on playback devices, except they are used for the purpose of making music and increasing workflow. However, the most common type of control beyond a pad are knobs, sliders, and buttons. These are often applied to voice volumes, EQs, and various effects. Each of these controls have their own standards for quality though the most important factors are generally durability and encoders. For buttons that are not pressure-sensitive, this functions mostly as an on/off action. However, knobs and sliders can be far more fickle in terms of their encoder quality. This is especially relevant to sliders if your MIDI pad is smaller than average. This quality can cover a whole host of features, but it generally refers to how well the MIDI pad controller manipulates and controls the DAW as well as any software packages it may bundle with it. This latter feature often refers to VSTs, proprietary plugins, various DAWs, and different MIDI development functions. Ultimately, the more software bundled may not always be the best depending on what other types of software you already use. For example, some MIDI pad controllers that come with DAW bundles may not be as easy to map onto alternative DAWs. Moreover, they may not always make full use of an alternative DAW’s features or complicate customization. While most MIDI pad controllers will ostensibly claim to be compatible with a wide variety of the most popular DAWs, this does not always come out in practice. Specifically, a MIDI pad controller with a pre-bundled DAW is liable to have been made for use with that DAW to the preference of others. A common occurrence is for a MIDI pad controller to bundle Ableton Live–one of the most popular DAWs on the market today. However, users of other popular DAWs, like Cubase or Propellerhead’s Reason may find that the MIDI pad does not automatically map to the DAW and may not even be recognized by it. This quality often has two components to consider: auto-mapping and customization. While various types of MIDI controllers used to have serious issues with auto-mapping not creating an intuitive or ergonomic layout, those issues are largely a problem of the past. However, custom mapping still rears its head as a pain for many users depending on the MIDI pad controller selected. While there is some factor in terms of the controller’s complexity of possible functions that comes into play here, sometimes the MIDI pad controller simply is difficult to program. This is similar to encoders in a way. If it works properly, you will not even notice it is working at all. Essentially, drivers provide the software necessary for the hardware hosting the DAW, whether a PC, laptop, or smart device, to recognize the MIDI pad controller. Unfortunately, there is no real “standard” for drivers, and each company pretty much stands on its own. However, when judging a MIDI pads controller’s drivers two factors stand out: updates and backwards compatibility. Basically, how quickly does a company update the controller’s drivers as technology and software continues to progress. Moreover, how old of software or hardware supports the MIDI pad controller. While many elements already covered, especially the software integration, can fall under ease of use, the sheer physical manipulation can also come into play here. For instance, controller knobs can utilize a variety of degree limitation in terms of actually manipulating them. Combined with the encoders, this can make those controls harder or easier to use. Still, one of the most common elements of ease of use for a MIDI pad controller will relate to its layout. Of course, this will often hinge more on playing style or familiarity than any objective measure, but there are still a few qualities that layout can demonstrate which affect the MIDI pad controller’s ease of use. One of the most obvious qualities of layout involves groupings and space. In this instance, groupings refer to how similar controls are arranged. For instance, knobs are often arranged in a line, while pads are generally arranged in a box. Because the pads are push activated, they do not necessarily interfere with each other. However, were knobs arranged in a box formation, manipulating more than one at a time could prove awkward and impede workflow. More so than a MIDI keyboard controller, a MIDI pad controller is often transported from one place to another–whether it is a studio, a home, or a venue for a live performance. This is in a large part because MIDI pad controllers are often smaller and more compact in general while still providing a wealth of functionality. However, this will always be a push/pull consideration. Essentially, the more robust MIDI pad controllers will often necessitate a large design. Moreover, the better quality controllers with more functions often include more internal components making them heavier. Ultimately, striking a balance between the dimensions and weight of a MIDI pad controller will come down to the user. If you generally produce music in a single location, bigger can be better. If you regularly play live shows, you may want a smaller, lighter model. Keep in mind, the dimensions of a MIDI pad controller will also often affect its layout and ease of use. The first MIDI pad controller on our list comes from Akai, the brand that is all but responsible for the MIDI pad controller in the first. While they may not have actually manufactured the first one ever, Akai did popularize MIDI pad controllers with their MPC line that can be found in many of the most popular hip-hop songs of the 1980s. More recently, Akai still carves a rather large slice of the MIDI controller market, though they have distinctly shifted from the top-tier market to the budding professional and consumer market. Still, with a history in the industry, the LPD 8 seeks to follow its predecessors while filling a specific niche. Specifically, the LPD 8 is the least expensive MIDI pad controller on our list making it our best budget option. It is important to keep in mind that coming in at nearly half the cost of its next closest competitor does mean you will have to expect a sacrifice in functionality. Thankfully, that does not mean you need to expect the same for quality of that function. [Green] The pads and knobs feel incredibly durable making use of the same high quality that most of Akai’s pads and encoders demonstrate. The response is excellent with both the velocity and precision of pads and knobs remaining consistent. However, this MIDI pad controller does feature the fewest pads on our list, and the dual lines of knobs are not the easiest to use. Moreover, there is no display or transport controls, and the pad lights are minimal as well as reserved to red. This means you will likely still have to refer to the DAW regularly to know exactly what is going on. At least this stripped down model is incredible small and light, but its functional limitations may not be the best for live performances without another piece of hardware. Following up the sparse offering of the LPD 8, Akai’s MPD 218 is a definite step up in terms of functionality. In fact, this MIDI pad controller goes a step above and beyond by managing to compete with other controllers on our list that feature far more individual controls. The Akai accomplishes this by providing a number of data banks. [Green] With the sixteen pads and three data banks, the Akai technically offers forty eight pads and eighteen knob controls. This latter amount is second only to the Ableton Push 2 which itself cannot be accomplished quite as quickly. However, it might be the combination of these features with iOS compatibility–something that is still taking a surprising amount of time to see full implementation across the product market–at an incredibly reasonable price that makes this such a steal in terms of value. Unfortunately, as with all values, the shoe must drop, and in this regard, it comes from a surprising place considering Akai’s reputation: pad encoding. Quite simply, the velocity of the MPD 218 is well beyond what most users expect and can require many music producers to step their precision up to be able to use the MIDI pad controller without hours of additional editing. Essentially, the MPD 218 is noted for producing double notes from a single push as well as ghost notes from buttons that are next to the one pushed. This is an incredibly surprising flaw since Akai generally prides itself on making some of the most responsive and accurate pads on the MIDI controller market–regardless the hardware design. Another surprising flaw is the absence of any true MIDI ports. This means that the MPD 218 will not actually be able to serve as a “true” MIDI controller and will require a DAW to function. 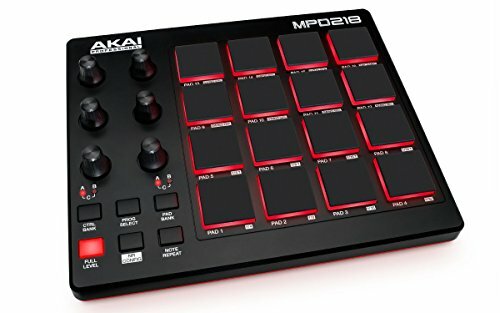 Complete Product Reviews Akai Mpd 218 and the entire Mpd range. Arturia may not have the same name brand recognition as some of the other products on our list, but that is likely because the company started as a budget-friendly, consumer market manufacturer of digital workstations modeled after classic analog synthesizers. However, this initial entry in a relatively niche market, combined with their collaboration with synth pioneer Robert Moog, only placed a premium on quality. Fast forward to modern day, and Arturia has begun to enter the MIDI market in full while still servicing its vintage-minded base. The Beatstep and its companion Pro model were an attempt to branch out into pad markets. As such, you should expect a few growing pains with Arturia while they still figure out exactly what current music producers demand from their equipment. [Red] These growing pains are made most apparent when you consider that the Beatstep Pro offers amazing architecture with an absence of features seen as givens in today’s MIDI pad controllers. The most glaring omission in this regard is the inability to save sequences. While it offers two sequencers as well as a separate drum sequencer, you cannot save and layer previously created sequences. Ultimately, this means that any sequence you make will require a hefty amount of interaction with the mouse and keyboard side of your DAW–exactly what MIDI pad controllers are supposed to alleviate. 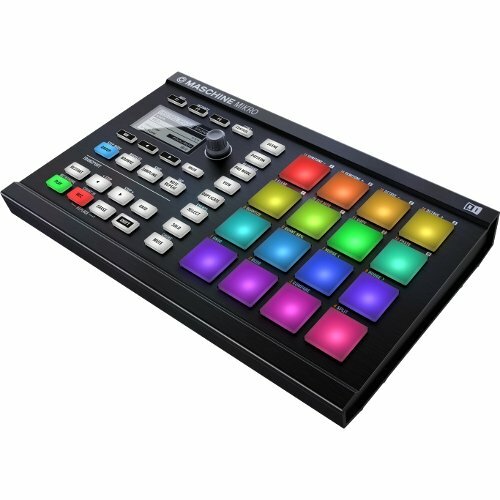 All of this would potentially be overlooked if the Beatstep Pro did not also carry a heftier cost than lesser products with this one, basic, expected feature. If you are familiar with MIDI pad controllers, chances are you have already hear about the Ableton Push series. When comparing this model to its previous iteration, the differences are immediately apparent. In fact, the overwhelming number of differences between the Push 1 and Push 2 do amount to differences of appearance–however, this should not be taken as a shallow, superficial set of differences. [Green] In fact, many of these changes are designed to either present more information in a readily digestible manner or allow using that information for an increased workflow. For instance, the display of the Push 2 is impressive to say the least. At 40mm of high-resolution, it is a full 33 percent larger than the first Push’s and blows the rest of the competition on this list out of the water. Aside from the display, the 64 pads, each with solid response and a full array of RGB lights offer an easy and visual representation of the various samples and sequences in real time. Combined with the 8 endless encoders, the Push 2 easily offers more controls than any other product on our list. As icing on the cake, using these controls feels intuitive and changing them effortless–once you figure out how to do so. This is actually the Push 2’s greatest downfall and is simply a consequence of its incredible capability–a double-edged sword if you will. Customizing the Push 2 takes a great deal of time and familiarity with your DAW. In another two-sides-to-every-coin issue, the Push 2 is designed exclusively for Ableton Live and does demonstrates severe bias in that regard making it less than ideal to use with other DAWs. Native Instruments has developed a fairly solid reputation in the MIDI music production market and for good reason. The brand consistently manufactures a high-quality product with excellent features and responsiveness. However, Native Instruments also often suffer from a similar issue as the Push 2–they really like to push their own proprietary software onto their users. Case in point, the Maschine Mikro Mk2 provides you with pretty much everything you need to start making music right out of the box. With 8 GB of included software–that you do have to download from the site and upload into the MIDI pad controller–you do not need too terribly many plugins to start making music. However, the Maschine also requires you integrate it with your DAW via a VST that does not always work as intended. [Red] Aside from the fact that setup is both time-consuming and often fraught with glitches, if not outright crashes that force you to start the process over, there are no knobs or sliders. When combined with only sixteen pads, the limitations on total control is lacking. Ultimately, they will be returning to your mouse and keyboard far more than intended when you purchased a MIDI pad controller in the first place. Still, the Maschine does offer an impressive display–though it is still far simpler and offers less information that the Push 2. Moreover, the features that the Maschine offer can accommodate even experienced producers with sixty four steps per sequence. This does make up for the fewer analog controls as the breakdown of patterns, groups, and scenes allows for some truly impressive finished products in the hands of a skilled producer. Novation is not stranger to the MIDI market and has arguably captured a wide swatch of the beginners and budget consumers. However, the is most certainly not the case for this MIDI pad as Novation seeks to strike a balance between features and price. 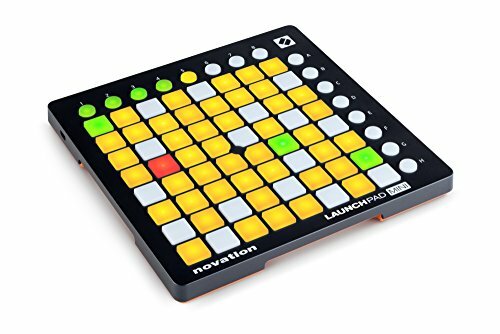 [Yellow] Specifically, the Novation is an incredibly complex MIDI pad to learn how to use. However, this is in a large part due to the nearly unparalleled level of customization that the Novation offers. Basically, if you want to customize all 80 of the buttons, you most definitely can. The only problem is that you are liable to spend days, if not weeks, figuring out how to do so. Unfortunately, this problem is only exacerbated by the fact that the Novation features little to no documentation. Considering that the brand often makes it a point to appeal to the beginner market, this is a distinct departure from that philosophy and the Launchpad Mini is definitely a MIDI pad more suited to those who already know how to program various types of MIDI hardware with numerous DAWs. Though, that last fact may not even be all that relevant as the Novation does not actually play well with too many DAWs. While it comes with a stripped down version of Ableton Live 9 and can technically work with FL Studio as well, Ableton is the only reliable DAW to use with the Novation. Moreover, the drivers for the Novation do not play well with Apple products either. Sadly, there is no clear answer in the search for the Best Midi Pad Controller. Different setups, levels of skill and experience, as well as intended use will drastically alter which one of these MIDI pad controllers is right for you. For instance, if you are well-versed in the art of controllerism, the Ableton Push 2 is arguably the only MIDI pad controller on our list that can allow you to connect to your DAW and then ignore it completely while producing music. However, this can make it a less than ideal product for live performances. 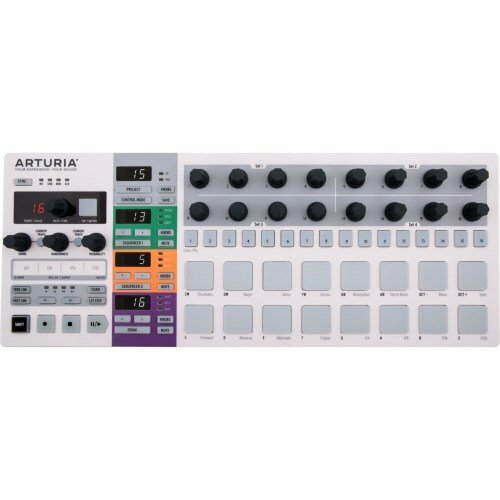 Conversely, the Arturia is most definitely not a great studio MIDI pad controller with its inability to save sequences, forcing you to regularly return to your DAW. However, if you are looking for a MIDI pad controller that is both easy to use as well as incredibly responsive, the Arturia provides a quality build, portability, and solid layout to make your performances pop.